Later this month, Stranger Things star David Harbour is headlining his first comic book movie, Hellboy. However, it won’t be his last one. According to The Hollywood Reporter, Harbour is lined up to join Scarlett Johansson in Marvel Studios’ Black Widow film. Harbour’s role wasn’t announced, and Marvel is once again maintaining secrecy. However, if Harbour can pull of a Russian accent, perhaps he could play Ivan Bezukhov, Natasha Romanoff’s mentor. Additionally, Variety is reporting that Rachel Weisz is also in negotiations with Marvel for an undisclosed role in Black Widow. Weisz co-starred in The Mummy and its sequel, as well as the 2004 Constantine adaptation. More recently, Weisz received critical raves for her performance in Disobedience and an Oscar nomination for her role in The Favourite. While Marvel has yet to officially announce its lineup of films for 2020, Black Widow seems likely to get the May 2020 slot. Florence Pugh will co-star in the film as a rival spy to Johansson’s Black Widow/Natasha. Marvel hasn’t released any story details yet. However, Black Widow is rumored to be set before Natasha joined S.H.I.E.L.D. and abandoned the KGB. It may also explore Natasha’s history in the Red Room, a secretive Russian program that creates ruthless spies and assassins. Cate Shortland is directing the Black Widow film from a script by Jac Schaeffer. 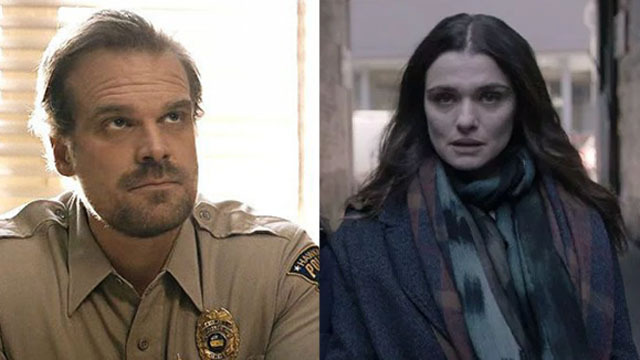 Are you excited to hear that David Harbour and Rachel Weisz are joining Black Widow? Which characters should they play? Share your theories in the comment section below!